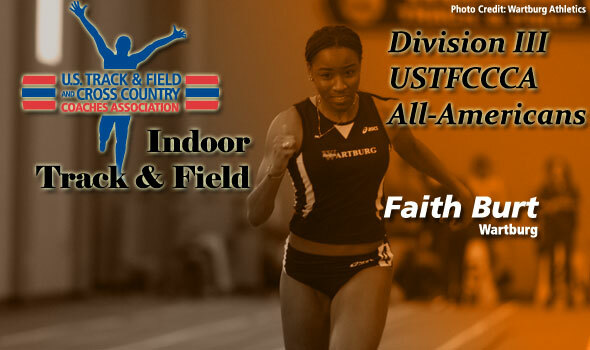 NEW ORLEANS – The U.S. Track & Field and Cross Country Coaches Association (USTFCCCA) announced on Tuesday the 300 student-athletes that will receive USTFCCCA All-America honors in Division III. A total of 337 awards will be presented to the 300 individuals as a result of a national top-eight finish in last weekend’s NCAA Indoor Championships in Greencastle, Ind. Top-ranked North Central College won the men’s national title with 52 1/3 points, over 18 ahead of the closest challenger, No. 3 UW Stevens Point. On the women’s side, No. 1 Wartburg claimed victory after scoring first place in the finale, the 4×400-meter relay. No. 3 UW Oshkosh was a near-second at 29, No. 14 St. Lawrence claimed third with 24 points.